Aircraft are part of the Islands life, we see Stewart Island Flights Britten Norman Islanders and Piper Cherokees as often as hourly as they ferry locals and visitors on and off the Island. And occasionally something a bit more exotic will make an appearance. But yesterday we had a reminder of the much larger world, far away from the Island. 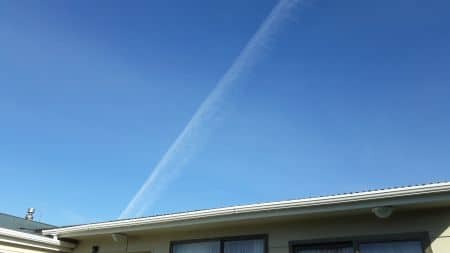 I was just back from Ulva with guests, looked up and saw a contrail stretching across the sky, heading North West towards Sydney (I presume). I looked up schedules on the Internet, and it would appear this one was out of Sao Paulo, Brazil. 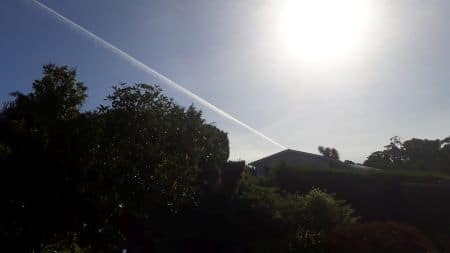 Now for the rest of the world a contrail would be pretty much “ho-hum”, but down here we don’t see so many. What intrigued me was just how fast the trail was blown eastwards. Assuming an altitude of 12000 metres within half an hour the trail had been blown somewhere between 80 and 100 km to the east … some pretty basic maths and guestimates of angles. Contrails over Stewart Island. Just 4 minutes after the aircraft went over, already being blown eastwards. Using the Chrome Browser ?? You may need to add an RSS Reader to Chrome. Follow this link!